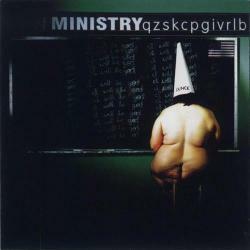 Dark Side of the Spoon is the seventh studio album by industrial metal band Ministry, released in 1999 through Warner Bros.
Records. "Bad Blood" was nominated for the Grammy Award for Best Metal Performance at the Grammy Awards of 2000. There are two theories behind the title (which occurs in the lyrics of the opening track), the first being a play on words, as it is easily noticed as a parody of The Dark Side of the Moon by Pink Floyd. The second is a reference to the blackened or dark side of a spoon when heated to dissolve heroin, as the band suffered from addiction of said substance at the time. The album's cover generated some controversy when retailer Kmart refused to stock it in its stores. The saxophone part of the song "10 / 10" is take from the last 22 seconds of "Group Dancers" on the Charles Mingus's album The Black Saint and the Sinner Lady.